It was to the initiative of Baron Pierre de Coubertin, IOC President from 1896 to 1925 and founder of the modern Olympic Games, that we owe the idea of creating this Museum. In the plan for the New Olympia, which he wished to set up on the shores of Lake Geneva, this visionary and educator wished to build a place that would bring together historical witnesses of Olympism. 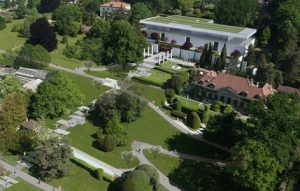 A prefiguration of the future museum finally found its place within the Villa Mon-Repos in Lausanne, the residence of the Baron and headquarters of the IOC between 1929 and 1937. On 23 June 1993, Pierre de Coubertin’s dream finally became reality when the then-IOC President, Juan Antonio Samaranch, inaugurated The Olympic Museum in Lausanne. Designed by Mexican architect Pedro Ramírez Vázquez and Swiss architect Jean-Pierre Cahen, The Museum is the embodiment of the universal values of sport defended so ardently by Pierre de Coubertin throughout his life: culture, sharing and education.